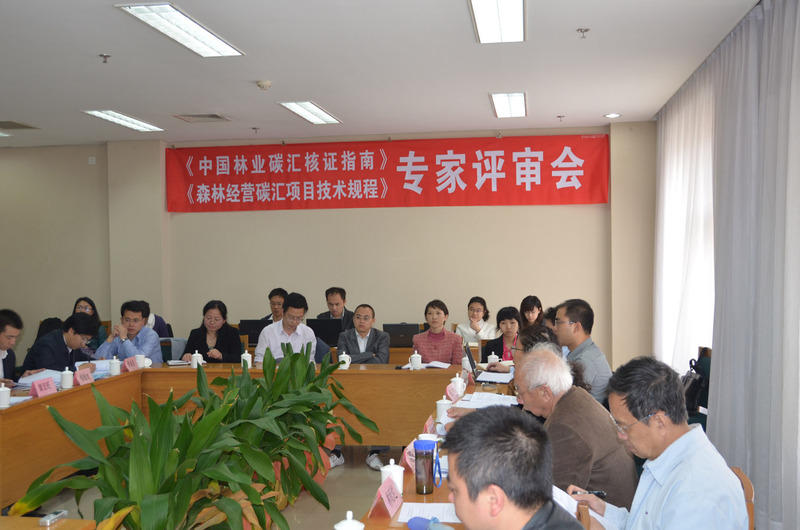 On April 29th 2011, China Green Carbon Foundation (CGCF) sponsored its specialist meeting in Beijing to evaluate China’s First “Forestry Carbon Sequestration Evaluation and Inspection Guideline (Tentative)” (hereafter refer to as the guideline) and the “Wenzhou City Forestry Carbon Projects Management Technical Regulation (Tentative)” (hereafter refer to as the Technical Regulations). The review meeting was chaired by Mr. JIANG Youxu, Academician of Chinese Academy of Sciences and Director of China Carbon Sink Study Institute, and joined by LIN Erda and ZHANG Xiaoquan, China’s well-known carbon sink experts. The experts group reached consensus and approved the above said guideline and the technical regulation with recommendation that the guidelines and the technical regulation will be practiced in production after some text revision and improvement. The specialists review group maintained that bringing forest carbon sink into full play in addition to the sustainable forest management would have become the imperative measures in mitigating and be adaptive to the climate change since the international community demonstrates extensive concerns in addressing climate change from the forestry sector. The scientific and specified quantification of carbon sequestration in evaluating the carbon sink afforestation projects emerged as the key issue. Under the auspices of CGCF, the Chinese Academy of Carbon Sequestration (CACS), Chinese Academy of Forestry had completed the draft. The review group holds that the said guideline characterizes with scientific innovation and is associated with practicality and workability. The guideline will provide three availabilities for China’s forestry carbon sink projects, i.e. accounting, verification and report of forest carbon sink which become a milestone in promoting China’s carbon sink market and forestry carbon development. The specialists also believed that the Forestry Carbon Projects Management Technical Regulations, which is compiled jointly by the Forestry Science Institute of Zhejiang Province and Wenzhou City Forestry Department with the guidance from the CGCF and the support by the experts from China Carbon Sink Study Institute, has filled the gap in China’s forest carbon sink management technical regulation. The technical regulation is in line and on track with international criteria and embodies Chinese characteristics. It can be used in the carbon forest management project and pioneer a new path in sustainable forest management in addressing climate change. This first technical regulation in China features scientific innovation and is associated with practicality and workability which will be trialed and tested after text improvement in a timely manner for reasons that there exists no unified international regulation so far. Academician JIANG Youxu , head of the review group, stresses that the guideline and the technical regulation exhibited the creativity and advancement since quite a few people in China and the world have been contemplating them and while currently there have been no full-fledged reference text that can be made use of. The guideline and the technical regulation will provide the benchmark for China’s forest carbon management as well as appealing in the international arena. It possesses important current and historical significance as they have provided China with discourse right in forest carbon management methodology.